Please note that our office is closed from 5.00pm Thursday 18 April 2019 until 10.00am Tuesday 23 April 2019. You can still use our online complaint and contact forms, however, these will not be received by us until we reopen on Tuesday 23 April 2019.
dealt with a total of 3,748 complaints (12% more than the previous year). This figure includes some carry-forward from the previous year. Upheld complaints are those that were valid for us to investigate, and that we fully or partly upheld. 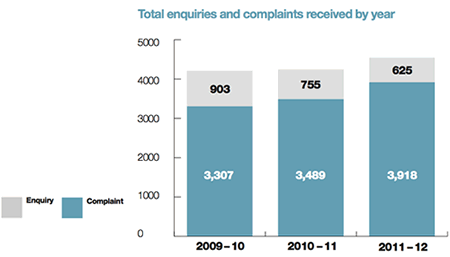 The overall level of upheld complaints rose from 34% in 2010-11 to 39% in 2011-12. In the health sector – where we can look at clinical decisions as well as administrative processes – the level of upheld complaints rose from 45% to 56%. In the local government sector, it rose from 29% to 32%. Premature complaints are those that we received too early (before the body concerned had a chance to respond to the complaint). The overall level of premature complaints we received fell from 51% in 2009-10 to 45% in 2010-11 and 43% in 2011-12. There are differences between sectors, but it is satisfying that the level of premature complaints about local government - the sector about which the SPSO receives most complaints - fell from 55% in 2010-11 to 52%. The Ombudsman sends some authorities an annual letter about their complaint numbers. Due to the wrong recording of the outcome of one complaint, we revised the tables of complaints determined on 29 August 2012. Sign up to read the latest news and reports from the Scottish Public Services Ombudsman (SPSO).